According to legend, Queen Victoria, informed of an early president’s angry insult to her ambassador, struck Bolivia off the map. But is it true? Men of this caliber did not expect to be be treated lightly, much less ordered to pay their respects to a pair of naked buttocks belonging to the president of Bolivia’s new mistress. Yet that—according to a tradition that has persisted since at least the early 1870s, and is widely known in South America as the “Black Legend”—was the uncomfortable experience of a British plenipotentiary who encountered the Bolivian caudillo Mariano Melgarejo in 1867. Accounts of the event go on to relate that when the diplomat indignantly refused, he was seized, stripped naked, trussed with ropes and thrust onto a donkey, facing backward. Thus afforded a clear view of the animal’s posterior, Britain’s outraged ambassador was paraded three times around the main square of the capital before being expelled from the country. John Augustus Lloyd: close associate of Simón Bolívar, British agent provocateur and plenipotentiary to Bolivia at the time of the Black Legend’s inception. 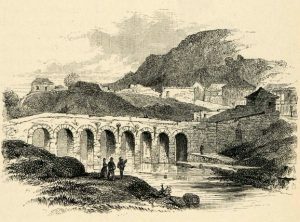 From an 1851 engraving. Arriving home a few months later, the Black Legend continues, the same man was summoned to an audience with Queen Victoria, whose anger at this insult to her majesty at least matched his own. Her immediate response was to order that a gunboat be sent to bombard the Bolivian capital in retaliation. Informed that the seat of Melgarejo’s government lay hundreds of miles inland and 9,000 feet above sea level—well beyond the reach of any purely naval expedition—the queen called instead for a quill. She then inked a thick black cross onto her map of South America and declared with an imperious flourish that “Bolivia does not exist.” Diplomatic relations between the two countries were immediately severed, not to be resumed until early in the 20th century. The Black Legend of Bolivia still circulates widely, much to the irritation of locals angered by its portrayal of their president as a hair-trigger oaf; it was the subject of an entire book by the Bolivian historian Humberto Vázquez Machicado and was cited as fact by the New York Times as recently as two months ago. Determining whether there is any truth to the story, though, requires careful research. For one thing, there are several versions of the legend, in which the nature of the initial insult varies as widely as the writing implement used by Queen Victoria to erase the offending nation from the map. For another, even when examined with the help of spadework in Bolivia and access to the original diplomatic documents from Britain’s inexhaustible National Archives, aspects of the story remain inscrutable. That there really was a serious dispute between the British and Bolivia in the middle of the 19th century is incontrovertible; that it involved a row between Queen Victoria’s man in the altiplano and a Bolivian president is a matter of public record, and that strong words of some sort were traded is clearly stated in contemporary documents. Yet the incident did not occur in 1867, it cannot have involved Mariano Melgarejo, and even several weeks of effort have failed to uncover the exact wording of the grievous insult offered up to the ambassador. Let us start by examining the bones of the Black Legend—and with a grateful acknowledgement that my guide to much of what follows is Olivia Saunders of the University of Glamorgan, perhaps the leading British authority on the recent history of Bolivia. My own research draws heavily on her mastery of the relevant archives. One day when the British ambassador called on President Melgarejo to present his credentials, the dictator was sitting at his desk, beside which stood his burro. Melgarejo, being quite drunk, told the ambassador to present his credentials to the burro, which the diplomat hesitated to do. So, the story goes, Melgarejo had both the ambassador and the burro led outside to the plaza in front of the presidential palace, where the surprised diplomat was compelled to ride around the plaza several times…. 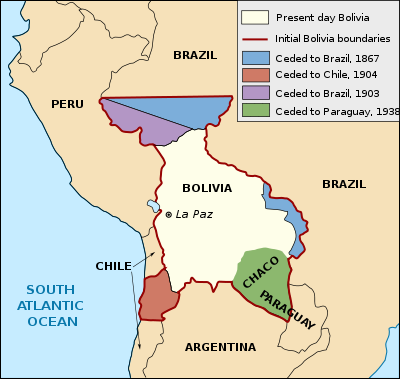 The changing shape of Bolivia, showing the loss of the coastal province of Antofagusta in 1904. (Although the transfer of territory was ratified in 1904, Antofagusta had been seized by Chile as early as 1880.) Bolivia still seeks the recovery of her coastline, and maintains a navy on Lake Titicaca. Map: Wikicommons. Other writers recount the same story with different details. 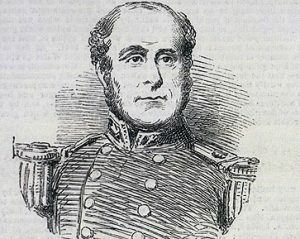 For Tristan Jones, a Welsh sailor noted for the telling of tall tales, the cause of the dispute was the theft of 600 tonnes of high-grade guano by the British merchantman Habsburg in 1842, and the consequence of the ambassador’s humiliation was the loss of Bolivia’s vital Pacific coastline to Chile in the War of the Pacific. For the mining engineer Anselm Guise and for Andrew Graham-Yool, a British writer based for years in South America, the spark was indeed provided by the homage that Melgarejo insisted be paid to his mistress, and Graham-Yool makes explicit reference to the woman’s naked backside. There is even a version of the story in which the president retaliates by crossing Britain off his own atlas of the world. The Bolivian historian Machicado, meanwhile, traces the earliest known version of the legend to Ramón Sotomayor Valdés’ Estudio Histórico de Bolivia, published in Chile in 1874—but adds that this first account mentions only that less than harmonious relations between the president and Queen Victoria’s man resulted in the “English cabinet” solemnly declaring that Bolivia should be erased from the map of “pueblos civilizados“—that is, civilized peoples. Further accounts and other details are legion, and according to Saunders they include versions that have the British representative refusing a glass of chicha, a cloudy local beverage made from fermented corn (and being punished for his temerity, in some more detailed tellings, by being forced to consume a gigantic bowl of cocoa); or importing a large quantity of English goods, duty-free under diplomatic privilege, to sell on the open market; or conspiring to overthrow the president. As for Victoria, she is variously stated to have used a pen, blue, green and red pencils, and even a piece of chalk to expunge Bolivia from her map. It is clear, in short, that the Black Legend is not quite history. Determining what really happened all those years ago, however, demands a more detailed knowledge of Bolivia and its progress after securing independence from Spain in 1825. It was a period of often considerable confusion, punctuated by frequent revolutions and dominated for long periods by the two presidents around whom the legend revolves–Melgarejo and his predecessor, Manuel Isidoro Belzú. The Bolivian capital La Paz in the latter half of the 19th century. Comrades, an insensitive throng of aristocrats has become the arbiter of your wealth and your destiny; they exploit you ceaselessly and you do not observe it; they cheat you constantly and you don’t sense it; they accumulate huge fortunes with your labor and your blood and you are unaware of it. They divide the land, honors, jobs and privileges among themselves, leaving you only misery, disgrace and work, and you keep quiet. How long will you sleep? Wake, once and for all! This inflammatory rhetoric soon took effect. By the spring of 1853, Bolivian peasants had begun to seize land from the oligarchs, a move that the president publicly backed. When the landowners took action to recover their property, Belzú retaliated by lashing out at their allies, the American and European merchants. He ordered the closure of their warehouses and banned exports of tin, a move that cost one British house, J. Hegan & Company, an estimated 15,000 pesos. 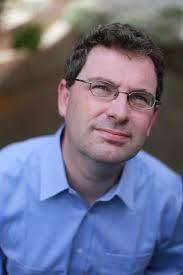 When Hegan’s Bolivian representative, an American named James Cunningham, called at Belzú’s palace and attempted to claim that money—and a further 30,000 pesos owed as the result of the abrupt cancellation of a government contract—he was beaten up and thrown out of the country. All this was in direct contravention of the Treaty of Amity and Commerce that Britain and Bolivia had signed shortly before Belzú came to power, and instructions were sent to the local chargé d’affaires to seek redress. This order, in turn, brought Belzú into contact with Colonel John Augustus Lloyd. 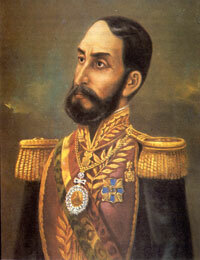 Mariano Melgarejo, who personally shot dead his predecessor and displayed his body from the presidential balcony. Lloyd certainly should have been the man for the job. He was an old South American hand who had served for several years on the staff of Símon Bolívar, the Liberator himself. In the 1820s he had surveyed Panama to plot the route of a possible canal, and after arriving in Bolivia as consul general he had toured extensively through the country, ascending to 14,000 feet to inspect remote coalfields and document the miserable lives of the miners there. have been issued without notice, suddenly prohibiting particular branches of trade in which British subjects were engaged… the Bolivian government has adopted a system in dealing with the interests of trade, which destroys the feeling of security, without which commercial enterprise cannot be carried on. Lloyd protested, only to find that the president consistently “disregarded” him. Kenneth Lehman writes that at this point, “Belzú issued him his passport and ordered him to leave the country,” leading Britain to break off diplomatic relations. Other nations followed suit; by July 1853, the American chargé d’affaires was the only diplomat left in the capital. 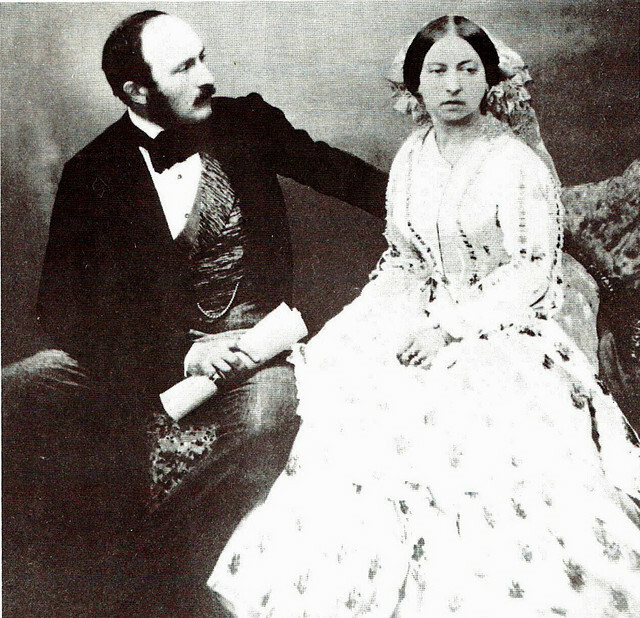 Queen Victoria, photographed in 1854 with her consort, Prince Albert. The Black Legend considerably exaggerates her role in British political life–giving a clue to its probable origins. Hints, though, seem to be all that we have. The Foreign Office documents of the period give few clues, referring only to Belzú’s refusal to reverse the closure of the warehouses. South American newspapers of the day say much the same, though they make it clear that it was Lloyd who demanded his passports, rather than Belzú who expelled him. And while the story did appear, very briefly, in several British newspapers around the middle of 1853, these reports are disappointingly vague. The Leicestershire Mercury wrote that the Bolivian president had “insulted the British Chargé so grossly as to compel him to leave,” while the London Daily News restricted itself to an oblique mention of an “insult received from the Bolivian authorities Colonel Lloyd… claimed satisfaction, &c., on behalf of a British subject unjustly and roughly treated in the town of Corrocorro.” That small mining town was the base of Hegan & Co., and hence the News‘s correspondent was probably referring to the American, Cunningham; what is significant, in this account, is that the News makes a distinction between the commercial “insult” Belzú offered to Hegan and a separate one he administered to Lloyd. That anything so dramatic as a naked ride athwart a Bolivian donkey ever occurred to Colonel Lloyd may be ruled out; if the newspaper stories are accurate, though, it is not unreasonable to suppose that an exchange of strong words did take place. As for how and where the Black Legend originated, both Machicado’s findings and the story’s details strongly suggest that it has its origins somewhere in South America. The legend’s portrayal of Victoria’s central role in British diplomacy—receiving ambassadors and ordering reprisals—is an outsider’s fantasy that bears little relation to reality; the Queen was a constitutional monarch who, while not so far above politics that she never dabbled in it (her preference for the lively Conservative leader Disraeli over the the Liberals’ earnest Gladstone is well documented), certainly played no active part in relations with South America. Yet the legend’s portrayal of Bolivia and its president is so unflattering it also seems implausible that it originated in that country. Machicado’s inability to trace the story further back than the Estudio Histórico de Bolivia may thus be telling; the book was published in Santiago, capital of Bolivia’s ancient enemy Chile, and its portrayal of an uncivilized mountain people chimes well with contemporary Chilean prejudices. It may be too late, now, to discover for certain how the Black Legend originated, though Saunders has hopes for a forthcoming research trip to Santiago. What can be said is that the story has enjoyed a remarkably long life and certainly has impacted on Anglo-Bolivian relations. 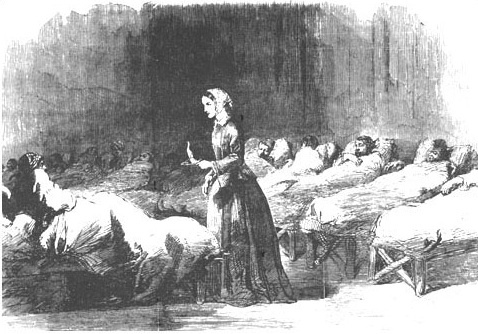 Florence Nightingale nurses cholera victims during the Crimean War. Contemporary engraving. As for the two protagonists in the affair, both Colonel Lloyd and General Belzú met their ends not long after the memorable encounter that set in train Bolivia’s Black Legend. Lloyd continued his adventurous career after his return to Britain, and at the outset of the Crimean War he was commissioned to “secretly raise the Circassians in the British interest,” apparently in the hope that trouble in the Caucasus would distract attention from the British, French and Sardinian armies invading Russia via its Black Sea coast. Lloyd traveled out to the Crimea, but fell ill there with cholera, one of well over 25,000 victims of the epidemic that would help to make the name of Florence Nightingale. Forced to return to Istanbul, he died there in October 1854. Belzú lasted longer. 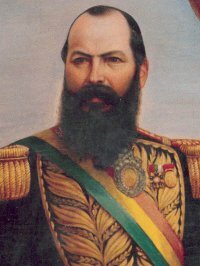 Having survived not only the assassination attempt but 30 revolutions and at least a dozen other plots to overthrow him, he turned the presidency of Bolivia over to his son-in-law, General Jorge Córdova, in 1855, and journeyed to Europe as his country’s roving ambassador. He was back in Bolivia by 1864, where he and Melgarejo became rivals plotting the overthrow of the highly unpopular President José María Achá.